A time before he moved on to paint some of his best known works, Van Gogh tried working with still objects after gaining enthusiasm from teaching a class. Through this, he learned colour shading. Our aim is to recreate the works of Van Gogh, one of Holland’s most distinguished artists, with utmost accuracy. Our artists are expertly trained in all of Van Gogh’s techniques such as colour mixing, rhythm of application, impasto, ambience, and brush strokes. When Van Gogh came to Nuenen, he taught a few friends how to paint with oil. The subjects were inanimate objects, which excited Van Gogh. He immediately went to work on his own paintings on still life subjects. 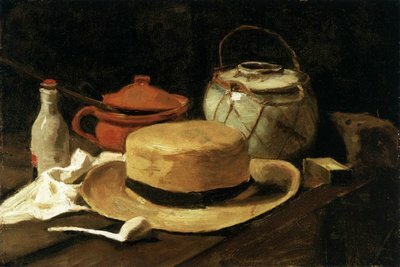 One of the paintings that he made during this time was Still Life With Straw Yellow Hat. Van Gogh accepted that it would be difficult to sell these paintings, but he deemed the effort valuable. Unfortunately, Theo said that the paintings were too dark, and not in line with the Impressionist trend that was currently in style. During this time, Van Gogh was anxious to learn as much as he could. During this phase, he created dark and sombre paintings that he felt were in tone with the mood that he was trying to set. Unfortunately, this was not widely accepted by the public, since most people liked bright and colourful paintings. After studying topics such as colour theory, he painted brighter paintings such as the sunflowers which represented his love for nature and its serenity. He ultimately created a theme which was synonymous to him, with rich colours and bright tones.